As the breeding season gets underway, the RSPB's investigations team has, sadly, received a number of reports of shot peregrines - including this one from Hampshire. On 11 March, a teenage girl discovered a peregrine falcon struggling to fly in King Somborne, Hampshire. It was taken to the Hawk Conservancy Trust in Andover where it was examined by a vet who confirmed that the bird had a fractured wing, caused by shooting. A blue ring on the bird’s leg, marked ‘GX’, revealed that the bird was born at Salisbury Cathedral in 2014 and is known as ‘Peter’. Peregrine falcons are the fastest birds in the world, able to reach speeds of over 200mph. Like all birds of prey, they are protected by law making it a criminal offence to kill or harm them. There are thought to be around 1,500 pairs in the UK – many of which now live in urban areas, where tall buildings like cathedrals make ideal vantage points and nesting sites. Peregrines are known to nest regularly in a nest box beneath the UK’s tallest spire, often producing their first egg just in time for Easter. The Salisbury peregrines have generated great excitement locally, and cathedral staff set up a CCTV camera to allow a glimpse into the private lives of these rare and magnificent birds. Peregrines are increasingly adapting to urban life. Most of us are privileged when a peregrine chooses to live among us, but these birds are still under pressure from persecutors. We are grateful to the girl for raising the alarm - the public really do have an integral part to play in combating wildlife crime. We'd also like to thank local police and the Hawk Conservancy Trust for their assistance. Last we heard, the peregrine was recovering at the conservation centre and "eating well". Though sadly there's no guarantee that, once the bird is re-released, it won't be shot at again. Also this month, we were contacted about a peregrine found dead in Cumbria, close to RSPB Geltsdale (pictured above). It was found to have historic shot wounds, though these were not deemed to be the cause of death. Clearly the bird had lived with the injury - but the fact remains that it had, at one point, been illegally targeted. A third was recovered, dead, from a church roof in Lytham St Annes, Lancashire in February. It too had been shot. 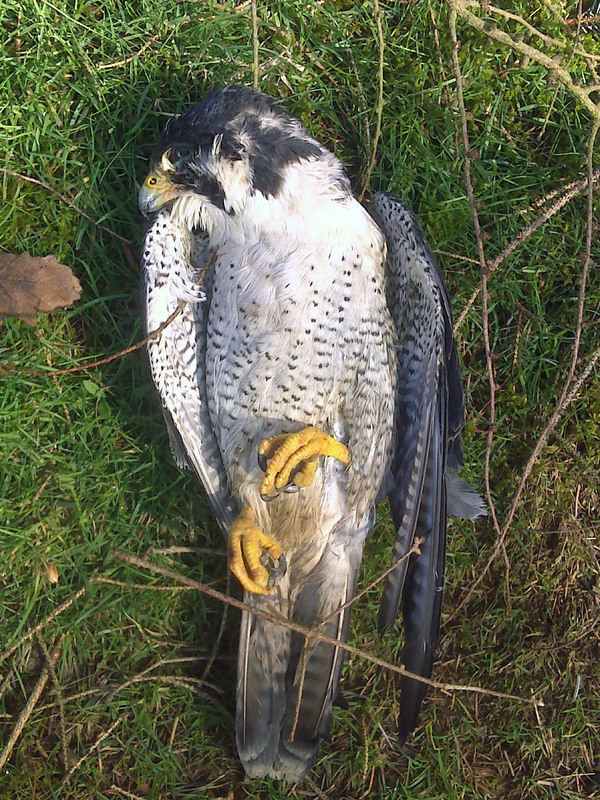 And just today (31 March), we received information about a further peregrine found shot in Tavistock, Devon. The bird, a female, was found on 6 March next to Milton Abbot primary school and taken to a vet, where an X-ray confirmed that a piece of shot was lodged in its shoulder. The peregrine is still alive and being cared for by a local falconer, to whom we owe a huge thank you. Devon and Cornwall police are making further enquiries. If you have any information, contact WCO PC Julian Fry via 101. 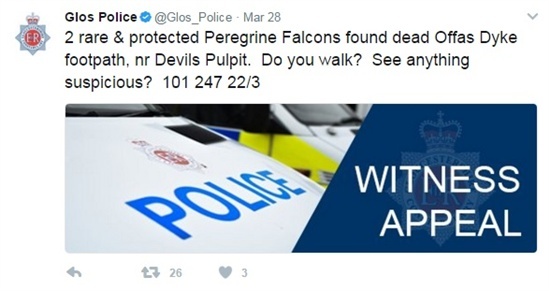 Also this week, police put out this tweet calling for information on two dead peregrines found in Gloucestershire. We'll bring you more information when we have it. If you find a wild bird which you suspect has been illegally killed, contact police on 101, RSPB investigations on 01767 680551 or click here to fill in the online form.